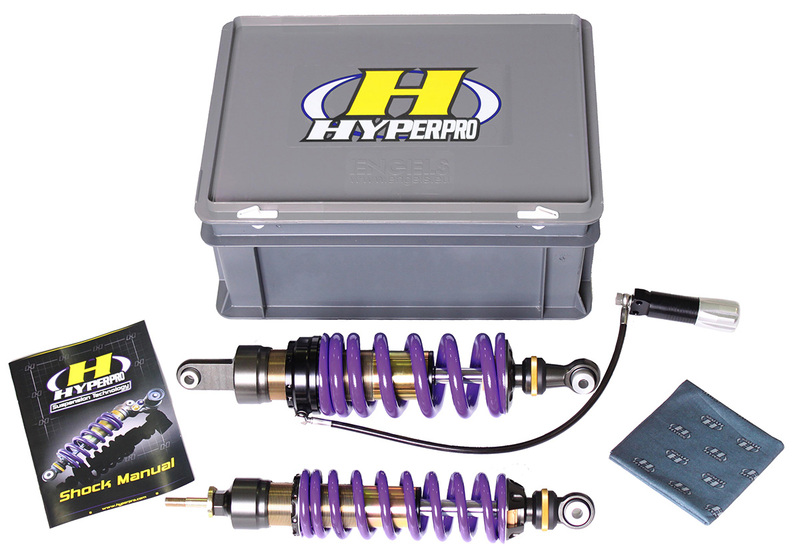 3 years ago the suspension manufacturer introduced the successful Hyperpro Streetbox concept. Now on EICMA Hyperpro presents another “all in one box solution”. The Hyperpro BMW “telelever” Streetbox! Hyperpro claims, that after a few years the suspension of many motorcycles, like also BMW models with both front and rear shocks are suffering of their age. Damping capacities are getting worse and the used springs are on average (a little) too soft. Next to that, shocks are also a wear part and needs to be serviced when possible or replaced after a certain period. But why spend a lot of money on good suspension as you are just an average rider. You have only the wish to have a good ride sometimes, instead of taking that long trip to Siberia or some South American trails. Or you have your BMW for commuting purposes. There are plenty of reasons why to upgrade suspension, like comfortable riding, easy cornering, no problems with passenger and or luggage, better braking, less tire wear… It would be a pity if you cannot use the benefits of these bikes, just because of a failing suspension. Hyperpro offers a solution with the Hyperpro BMW “telelever” Streetbox. A front and rear emulsion shock, with an fine adjustable rebound adjustment, progressive springs in purple or black and a hydraulic preload adjuster for the rear shock at a very sharp price, all in one box! The Hyperpro BMW “telelever” Streetboxes are available for almost all BMW models with a front and rear shock, but without the ESA-system. 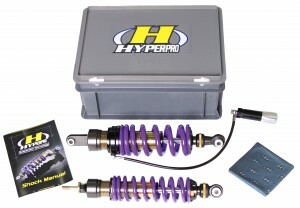 BMW’s with frontfork springs and rear shock are available within the Hyperpro Streetbox program. Ask your dealer or the distributor in your country for the possibilities.